Pokemon has seen a bit of a revival this year with the new mobile app game - Pokemon Go released in the summer and the 20th anniversary celebrations. My kids have been Pokemon fans for quite some time, and happy there are some cool new toys, merchandise and games this year. There is a ton of Pokemon toys, games, trading cards and merchandise to get for any age Pokemon fan. We've selected some of our favourites below. The Pokemon 3DS games, Sun and Moon, introduces the player to a new adventure in the Alola Region of tropical islands. Both games have similar gameplay, but have different starter Pokemon and legendaries. Each game features exclusive Pokemon. There's also a new feature known as Z-Moves (see the wearable below), which give Pokemon great power for battle. Kids who love to collect Pokemon cards would really like these Pokemon TCG tins. There are 40 trading cards inside with one special foil card. Plus you get a useful tin to store all your cards. The Pokemon handbook is essential for any fan. This version is a revised and updated one with facts, figures and evolutions of over 700 Pokemon. This one is on my 7 year old's wish list! Same traditional monopoly game, but with a Pokemon twist. We actually own this set, and the kids love playing the game. The tokes are small Pokemon and you buy Poke Balls instead of stations and Gyms instead of property. Apart from being a Pokemon theme, the game is played like traditional monopoly. The Pikachu is this year's 20th anniversary plush toy. There are lots of other plush Pokemon available too. Both my boys have their favourite Pokemon as plush toys and they are currently elevated to "best teddy" position. The Z-ring is a new connected toy for 2016. It is compatible with the new Sun and Moon games. It can either be used as a connected add-on to the game for a "4D" experience or used as a role play toy. The Z-ring should work with a 3DS and 2DS. The set comes with 3 Z-Crystals, a Pikachu figure and the Z-ring (which can hold up to 6 crystals) Additional Z-Crystals are sold separately. It's recommended for ages 4+ and requires 2 AAA batteries which are included! Although the hype of Pokemon Go is over, there is still a strong fan base who plays the game. It is definitely still popular in my family, although we don't get a chance to play that often at the moment. 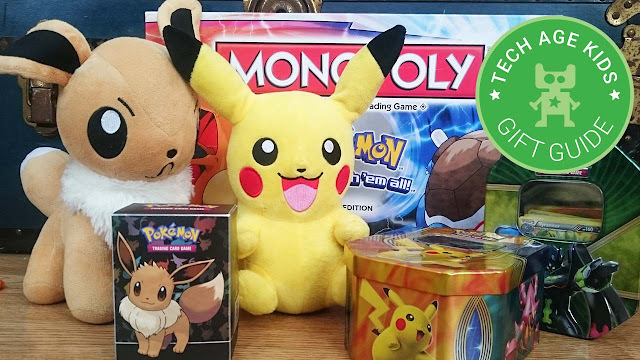 The gift ideas below would be perfect for a true Pokemon Go fan! If you've ever played Pokemon Go, you'll know it eats your mobile battery life. A power bank is an essential gift for a Pokemon Go fan, and why wouldn't you want one shaped like a Poke Ball? The new Pokemon Go Plus wearable connects with your phone via bluetooth and alerts you via LED and vibration of events in the game. In theory you should be able to walk around and the wearable will notify you when there is a Pokemon nearby. See other ideas for wearables for kids. Pokemon Go fans would appreciate a waterproof phone case with a lanyard to during an outdoor Pokemon hunt. Read: Is it safe for kids to play Pokemon Go? The Pokemon Go Field Guide is an Unofficial guide to Pokemon Go, packed full of tips and tricks to become a Pokemon Go master trainer. The idea is to use it as a reference guide, and read up useful hints to find Pokemon in the real world and help you "Catch 'em All". We also recommend the Circuit Playground (read our review) for the more techie kids interested in making with electronics. Adafruit built a Pokemon Go badge project using the Circuit Playground. It's still in developer edition, but we're looking forward to more projects and material available for this useful and versatile electronics board in the new year.